There is an unsurpassed scenic Ocean Path walking trail that begins at the far end of the upper parking lot at Sand Beach, and then meanders in a southerly direction along the eastern shore of Mount Desert Island for approximately 2 miles (3.2 km) until it arrives at Otter Cliff and Otter Point (4 miles or 6.4 km round-trip). There are numerous excellent spots to stop and take in the fantastic sights around you so take advantage of them. Watch for the short side trails on the left that take you closer to the shoreline. Place close attention to the waves as once in a while there can be larger rogue waves. About half-way between Sand Beach and Otter Cliff, is the famous Thunder Hole. If the waves and the tide are just right, you just might get to hear the signature sound that is like thunder while still some distance away. Just as you arrive, you will likely notice the aroma of the salt air but also mixed with the aromatic smell of the many wild rose bushes next to the entrance. Granite stairs with railings take you down to the viewing area. Below the surface of the water at the end of the inlet is a concave space. When the water pulls back, air gets into the little cave but then is trapped when the next wave comes crashing in. As the air is forced out, it creates a deep and loud “clap” like sound. Next, about half way between Thunder Hole and Otter Cliff on the right side of the Park Loop Road, is a small parking area for visitors to the Gorham Mountain Hiking Trail. This is another special place that not many people even know about. 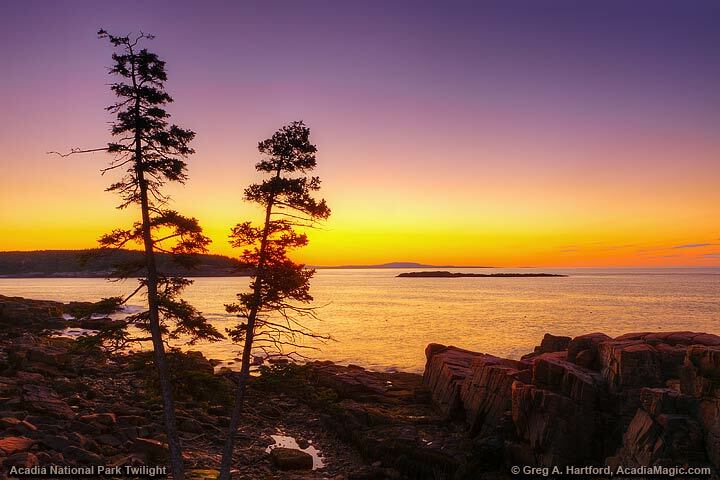 The hike is one that should be considered, especially for the spectacular panoramic views of the eastern coastline of Acadia National Park on the island. From this vantage point, you can see from Sand Beach to the north all the way south to Otter Cliff. Schoodic Peninsula is also viewable in the far distance. If you would like to experience a leisurely stroll in a spectacular setting, it does not get any better than this. For other hiking paths click hiking trails. At the southern end of the path is Otter Cliff. This massive headland is one of the most recognizable geographical features in the park. You really do not get how large it is until you see someone standing on top of one of the ledges. This puts things in proper perspective. Just before Otter Cliff is Monument Cove. Look for the short side trail on the left as there are some great photographic images waiting to be captured from this vantage point, especially when the first light of the morning turns the cliffs a golden color. 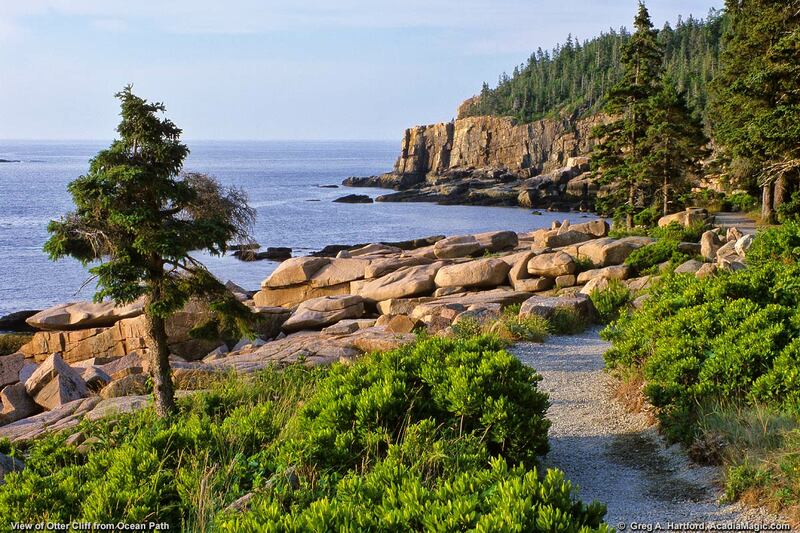 Between Monument Cove and Otter Cliff are the distinctive round boulders seen in so many images. I can think of no better place within Acadia National Park to consistently be able to capture such a wide variety of often stunning images than along the Ocean Path on the eastern side of Mount Desert Island. A person can literally spend a whole day just in this one area that extends from Sand Beach all the way South to Otter Cliff without exhausting the photographic possibilities. 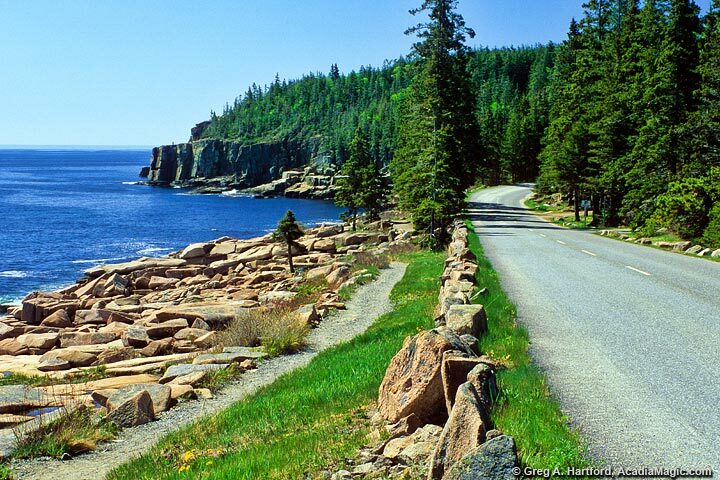 One thing to keep in mind is the fact that the Park Loop Road is one way here, but there is an access point to the South just before Otter Cliff where the Otter Cliff Road connects up with the Park Loop Road from Route 3 on the South side of Bar Harbor. This is a handy access point when needing to get to Otter Cliff or Monument Cove for a sunrise when the time is tight. It is also handy when you must exit the park to get to another spot to the West or get back into the Bar Harbor business district for something. When my intention is to do some “before the dawn,” or sunrise shooting in this area, I seem to have the best success when I arrive in plenty of time in order to choose the best spot depending on the existing light and the tide level which can vary considerably.